Swiss artist Marcus Kraft works with public art and visual art. 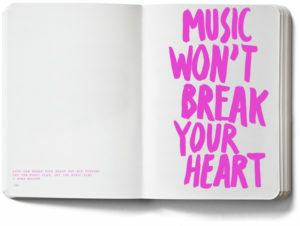 He has published two pop-art books, including “Don’t Eat the Yellow Snow” and “Don’t Talk Just Kiss”, billed as pop-music wisdom. Marcus has exhibited the work from these two books in numerous cities, and he will be exhibiting as part of the Fresha Festival in Durban, South Africa this January. The Fresha Festival is a free, outdoor, open-air festival on the Durban beachfront. His work will take the form of printed flags within the festival site vacinity, under the heading “Advice from Songs”. To build around this exhibition, Twist Projects (the theatre company behind Fresha Festival) hosted a workshop at the KZNSA Gallery in December 2018, where people were invited to make their own flags with advice from their favourite songs. These flags will be added to the exhibition and hung at the festival. During the festival weekend passers-by will be encouraged to add their own flags. The artworks will be on display throughout the festival period.